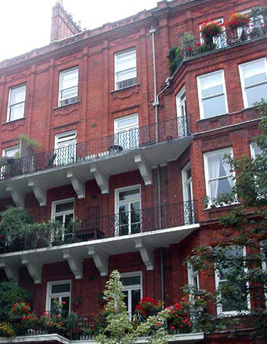 External refurbishment of a Victorian mansion block in Earl’s Court. The works were prompted by the fall of a large piece of masonry from one of the stone balcony brackets and thus a full inspection of all 24 brackets was required. Strengthening works were undertaken by drilling and grouting in stainless steel reinforcement rods. As a full scaffold was required for the works it was decided to undertake a full schedule of masonry repairs and redecoration.